Ger van Elk is internationally considered to be one of the pioneers of conceptual art. Averse to conventions, Van Elk experimented with many different media and frequently collaborated with fellow artists, including William Leavitt, Allen Rupersberg and John Baldessari and Bas Jan Ader among others. In 1969 he participated in the groundbreaking exhibitions When Attitudes Become Form at Kunsthalle Bern and Op Losse Schroeven: Situaties en Cryptostructuren at the Stedelijk Museum Amsterdam; the latter still counts as the introduction of conceptual art in the Netherlands. Van Elk realized at a young age that “theory was nothing but a construct, a work of artifice”, after his mother remarried and he had to become Catholic instead of Protestant overnight. It proved to be a crucial moment for his art practice, the insight that truth is not truthful and that one theory is always interchangeable with another. In his witty and radical work, Van Elk analyzed the role of the artist, explored the question of authorship and originality and examined the dubious relationship between image, imagination and reality. Ger van Elk tried to disrupt the established art world one artwork at a time. The idea for this exhibition was born a few years ago when Van Elk was still alive. He loved the idea of exhibiting his work alongside younger generations of artists. The concept evolved into the current presentation in two locations. GRIMM will exhibit a selection of historically important work by Van Elk at the Keizersgracht, ranging from sculptures like Rope Sculpture (1968) to Niet Werkelijk Woef (1987) and works in other media such as his famous video Some natural Aspects of Painting and Sculpture from 1970 and paintings from the early 1990s. At the Frans Halsstraat a group show will be presented by various artists who were either influenced by his work, or with whom we can draw our own parallel with Van Elk, be it because of a similar (conceptual) approach or by the use of a medium that he pioneered. We are proud to announce the participation of Elizabeth Price (UK, 1966), who received the Turner Prize in 2012 for her installation The Woolsworths Choir of 1979. Within a specially constructed area in the gallery, Price will present her work K (2015), an overwhelming two-screen projection. Ger van Elk pioneered film as a conceptual art form in the 1970s and Price is pushing the boundaries of video art today. Her installations examine the forces that are at play when many different technological histories coincide, and appeal to both the senses and the intellect, and usually take years to make. 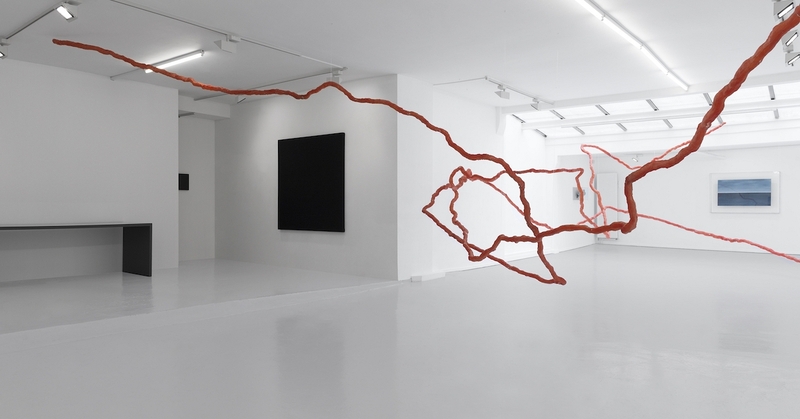 Willem de Rooij (NL, 1969), whose solo exhibition at the Museum für Moderne Kunst in Frankfurt opened in October 2016 and who is currently presenting a solo show at the Institute of Modern Art in Brisbane, will exhibit two works on canvas and his installation Route Along 18 corners that guided the visitor past eighteen niches of the rooms at the Stedelijk Museum Amsterdam in 1993 and 2010. Both the dry-humorous approach and a preoccupation with the conditions of the exhibition space express a strong affinity with the work of Van Elk, especially his early installations as Hoe hoeker hoe platter (1972) and Apparatus scala dividens (1969), that have both been on view at the Stedelijk Museum. Van Elk’s Well Polished Floor (1969-1980) was executed three times at the Stedelijk Museum Amsterdam, and is part of its collection. 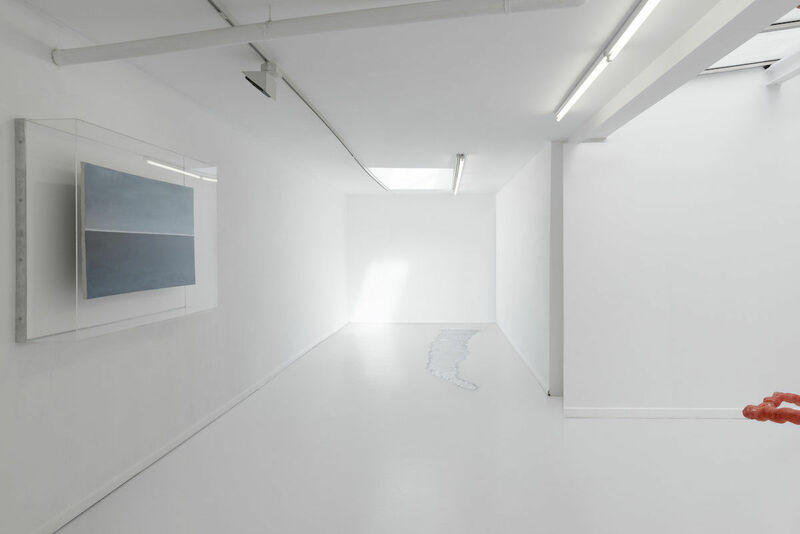 Within the group exhibition at the Frans Halsstraat, this iconic piece resonates in a site-specific floor installation by Adriano Amaral (BR, 1982). In his work, that is currently also on view in a solo exhibition at the Vleeshal in Middelburg, Amaral creates delicate installations in which materials, gestures and objects are drawn into the realm of the personal and intimate. By mixing material, image and composition he creates alternate layers of association. Sometimes harmonious, sometimes discordant, the result of his procedure shows a humanized reflection of time and shape in the space where the human form and architecture meet. Amaral shares a profound interest in the nature of the materials that surround us with Van Elk. But while Van Elk turned to rope, pole and canvas, Amaral takes his material experiment into the 21st century by mixing all kinds of artificial products such as silicone, aluminum and concrete with natural resources. The work of Daniel G. Baird (US, 1984) is a layered examination of the place mankind occupies within the inevitable passage of time. Baird is interested in the traces that symbolize our relationship to time and progress. Fossils, hidden within sedimentary layers of the past, embody the omnipresent and infinite symbolism of a horizon. This understanding of the horizon, as a place where things appear and disappear, held the interest of Ger van Elk as well. It contains an elusive and ever-changing phenomenon. Letha Wilson (US, 1976), who recently exhibited a solo show at the Center for Contemporary Art and Culture at PNCA, Portland, OR, also reflects on Van Elk’s relationship with the horizon and his play with illusion and reality. She will present two works, one of which she produced specially for Bearable Lightness of Being. 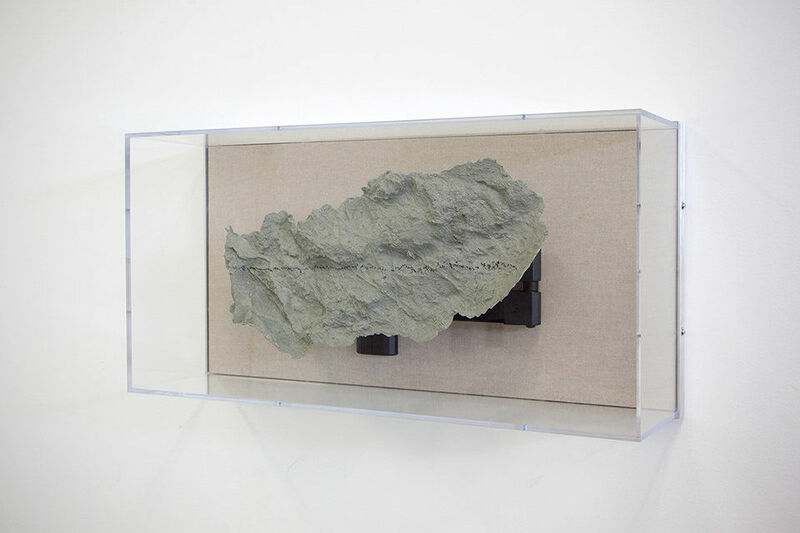 Like Van Elk, Wilson challenges the dividing line between image and truth. But where Van Elk aimed to demonstrate photography’s inability to represent reality, Wilson’s works are experiments in overcoming this duality altogether. Urs Fischer (CH, 1973) will present Spinoza Rhapsody (2006), a large-scale sculpture flowing through the gallery and taking the form of a three-dimensional drawing. The work has a direct link to Ger van Elk’s Rope and Camping Art works from the late 60s. The title of the work Spinoza Rhapsody, simultaneously refers to the Dutch philosopher Baruch Spinoza and to a musical composition of irregular form and free-flowing structure. Fischer’s enigmatic titles that frequently use real or fictional characters and common nouns in a witty manner, reinforce his works’ capacity to challenge conventions and hierarchies. Like Van Elk, Fischer is renowned for rejecting material hierarchy and often works in a range of “poor materials” (from apples to burning candle wax to egg shells). Spinoza Rhapsody was first shown at Stedelijk Museum Amsterdam (2006) and has since been on view in various institutions, including recently at Musée d’art et d’histoire, Geneva (2016) and at Palazzo Grassi, Venice (2012). Mark Handforth (HK, 1969) who recently had a solo show at Museo d’Arte Contemporanea Villa Groce, Genova, will present his work Rope Snakes (2008), a monumental cast-bronze sculpture in the form of a coiled rope. The work consists of two textured ropes, partly curled on the floor, but with their intertwining ends gracefully rising into the air. 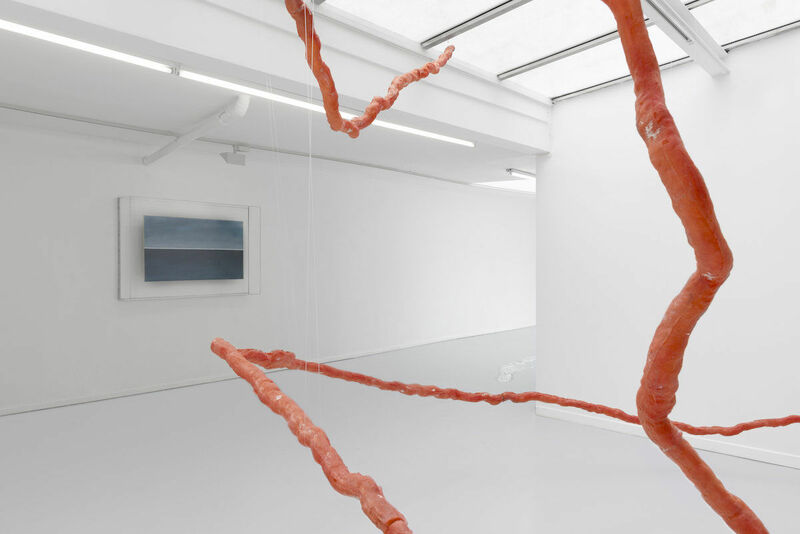 Rope Snakes brings to mind Van Elk’s Rope Sculpture (1968, on view at GRIMM Keizersgracht), in the form of a taut rope that travels horizontally through the space and holds two thick ropes that are hanging loosely and whimsically reaching down to the ground. Van Elk’s Rope Sculpture represents his redefinition of artistic media and rejects the traditional sculptural form, while Handforth’s Rope Snakes manipulates form and size as a way of transplanting a familiar object into unfamiliar surroundings and reveals something new about the ways in which these forms exist in our everyday lives. Giulia Cenci (IT, 1988) presents two sculptural works that are reminiscent of Ger van Elk’s The Specific Gravity of the Artistic Imagination from 1972, showing different materials swirling around each other, intertwined. The horizontal installation is another reference to Van Elk. Cenci studied at Accademia di Belle Arti di Bologna, Italy and got a Master in Fine Art at the St. Joost Academy, Den Bosch, NL. She is currently attending De Ateliers in Amsterdam. For more information, interview and royalty free image requests please contact press@grimmgallery.com, +31(0) 20 6752465.